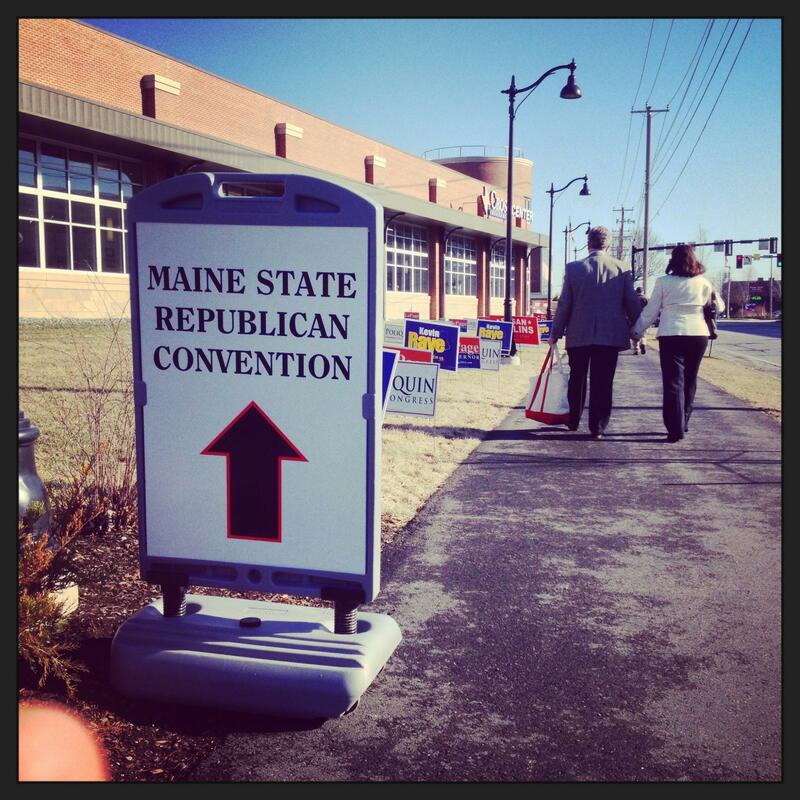 The walkway into the Cross Insurance Center in Bangor where the GOP convention was held April 25-26, 2014. 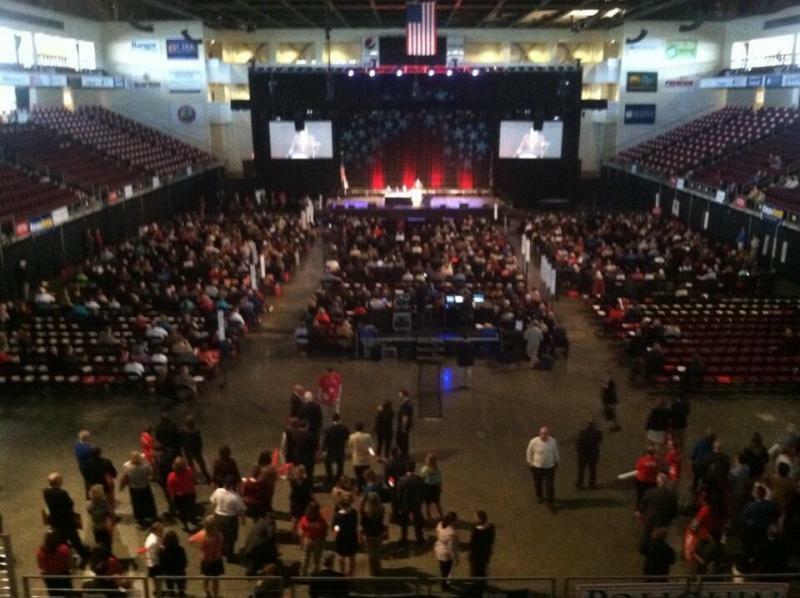 GOP Convention goers inside the Cross Insurance Center in Bangor on April 25, 2014. The opening night crowd engaging in applause at the GOP Convention inside the Cross Insurance Center in Bangor on April 25, 2014. U.S. 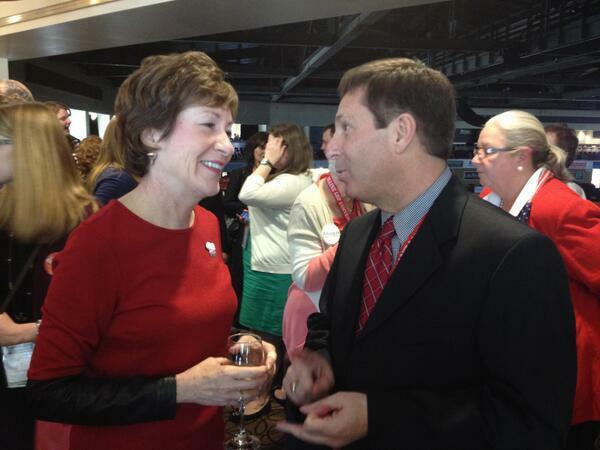 Senator Susan Collins (left) and Maine House Minority Leader Ken Fredette interact in the Senator's hospitality suite at the GOP Convention inside the Cross Insurance Center in Bangor on April 25, 2014. LePage told the GOP convention crowd on Saturday that he's being targeted by labor unions on a sort of political hit-list. He told the party that he's "the number two man" to remove from office behind Michigan Governor Rick Snyder, who successfully passed a right to work law where workers would not need to give their financial support to a union. LePage claimed he is being targeted as well because he also tried to pass such a law. "You know what I say to that?" LePage asked. "Bring it on!" Gov. LePage said he will continue to work for Maine residents and against special interest groups, as he seeks another term. "November is going to be a very important date, jobs, reforming welfare off our streets," he said. The Republican governor used his speech at the state party convention Saturday to highlight his accomplishments and take shots at his opponents. LePage defended his administration's efforts to overhaul the state's welfare programs. He said Republicans are dedicated to ensuring a strong safety net for those who need it, but will continue to crack down on fraud. Republican Senator Susan Collins, is also on the campaign trail leading to this November. She said President Barack Obama's health care overhaul is an "ill conceived" law that reflects the administration's overreach of power. Collins said it's time to replace the law with more effective reforms to the health care system. She is being challenged in November by Democratic candidate Shenna Bellows, the former executive director of the American Civil Liberties Union of Maine. The GOP convention also featured Senator Rand Paul of Kentucky and North Carolina governor Pat McCrory. The Kentucky Republican came to support Maine's party members at the convention. Paul is rumored to be a possible candidate for the 2016 presidential ticket, but he warned Republicans that they'd have to come together to win seats. The Maine GOP has been plagued by some in-fighting. In 2012, libertarians made headlines when they rallied to successfully endorse Paul's father, Ron Paul, for president, to the dismay of the party's Mitt Romney supporters. In his speech to the convention, Senator Paul listed some areas where the GOP could improve. Paul also said that the GOP must not be the party of corporate welfare. But this year's convention theme was "unity" said GOP party chair Rick Bennett. His goal, he said, was to "get republicans pulling on the same oar." 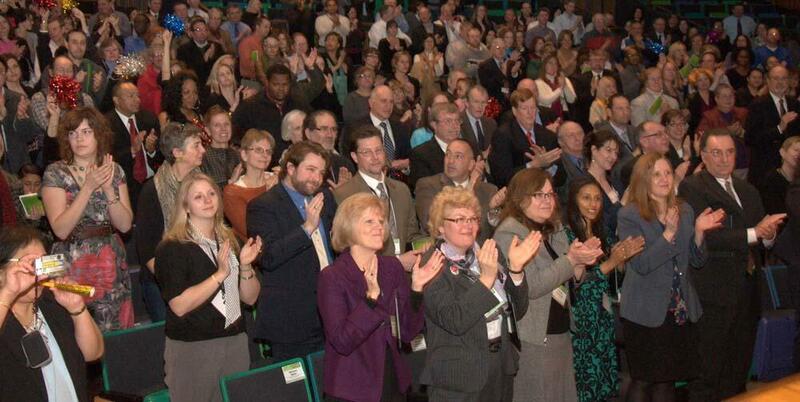 Meanwhile, Maine Democrats are responding to the unity message with a golf-clap. Party chair Ben Grant said Republicans are "unified behind catastrophic policies that harm the middle class and damage our economy." Asked about the LePage's convention speech, Democratic Gubernatorial candidate Mike Michaud said he can't control how the governor runs his campaign. "We're going to be running a positive campaign and if the governor's going to be running a nasty campaign that's up to him," Michaud said. Independent candidate for Governor Elliot Cutler said one impression he's gotten from reports about the GOP convention is a negative one. "Governor LePage simply continues to call everyone he doesn't like a liberal and everything he doesn't like welfare," Cutler said. Grant and others in the Democratic Party called the GOP convention a "Tea Party" convention with ultra conservative guests and step backward for Maine. Democrats have their turn next month when their party convenes at the end of May. (Portland) The latest poll on this year's gubernatorial race bears an eerie resemblance to the 2010 election result. Ther's Republican Paul LePage in first place with 38 percent support, just barely ahead of the second candidate with 37 percent and just 20 percent for the person in third place. The difference: It's Democrat Mike Michaud who's second in the Pan Atlantic SMS poll, Independent Eliot Cutler a distant third.